The underlying premise of the Theory of Constraints (TOC) is that organizations can be measured and controlled by variations on three measures: throughput, operational expense, and inventory. Inventory is all the money that the system has invested in purchasing things which it intends to sell. Operational expense is all the money the system spends in order to turn inventory into throughput. Throughput is the rate at which the system generates money through sales. Before the goal itself can be reached, necessary conditions must first be met. These typically include safety, quality, and legal obligations. 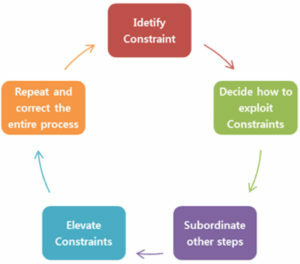 Theory of Constraints is based on the premise that the rate of goal achievement by a goal-oriented system is limited by at least one constraint. This can be identified in the excessive, often dangerous overuse of fork trucks on the manufacturing plant floor. Only by increasing flow through the constraint can overall throughput be increased. Decide how to exploit the system’s constraint(s). Repeat and Correct the entire process. Until recently fork trucks have been seen a source of inertia causing a system’s constraint. A constraint is anything that prevents the system from achieving its goal. There are many ways that constraints can show up, but a core principle within TOC is that there are not tens or hundreds of constraints. 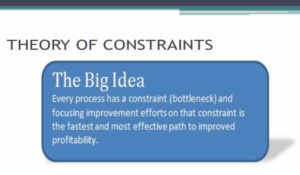 Constraints can be internal or external to the system. An internal constraint is in evidence when the market demands more from the system than it can deliver. If this is the case, then the focus of the organization should be on discovering that constraint and following the five focusing steps to open it up (and potentially remove it). An external constraint exists when the system can produce more than the market will bear. If this is the case, then the organization should focus on mechanisms to create more demand for its products or services. Failure of fork trucks, safety hazards caused by fork truck and the operators, are clearly identified as constraints corrected by a rapid adoption of North American Fork Truck Free Initiatives. Within manufacturing operations and operations management, the solution seeks to pull materials through the system, rather than push them into the system. While TOC is not as widely adopted as Lean Manufacturing or Six Sigma, it still provides the examination: “Why the Fork Truck Free Movement is the North American 2017 Material Handling Trend,” being hosted by Topper Industrial at Promat 2017 at McCormack Place in Chicago on Monday, April 3, 2017 at 12:45 PM – 1:30 PM in Theater D. The session will also be repeated on Wednesday, April 5, 2017 at 3:00 PM – 3:45 PM in Theater E. To register for ProMat, go to: http://www.promatshow.com/register.aspx?ref=attendees&acid=42396. For more information about Fork Truck Free initiatives, go to: https://forktruckfree.com.